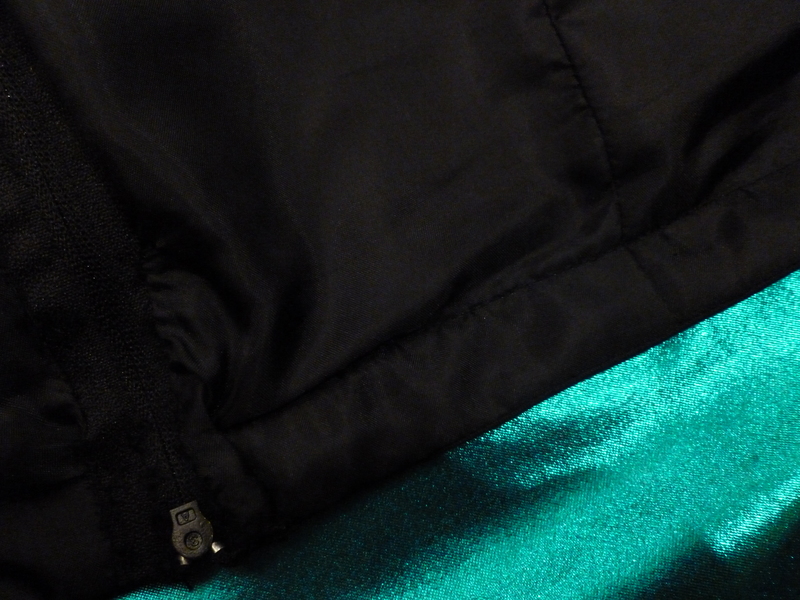 I quite like how it has turned out but as with the material itself, the reaction to the skirt was eh… mixed! My original plan was to make a short straight skirt from the material but I gave myself a lot of leeway with the length and eventually decided to keep it long. There’s a fair bit of stretch in the material so you can get away without a slit. 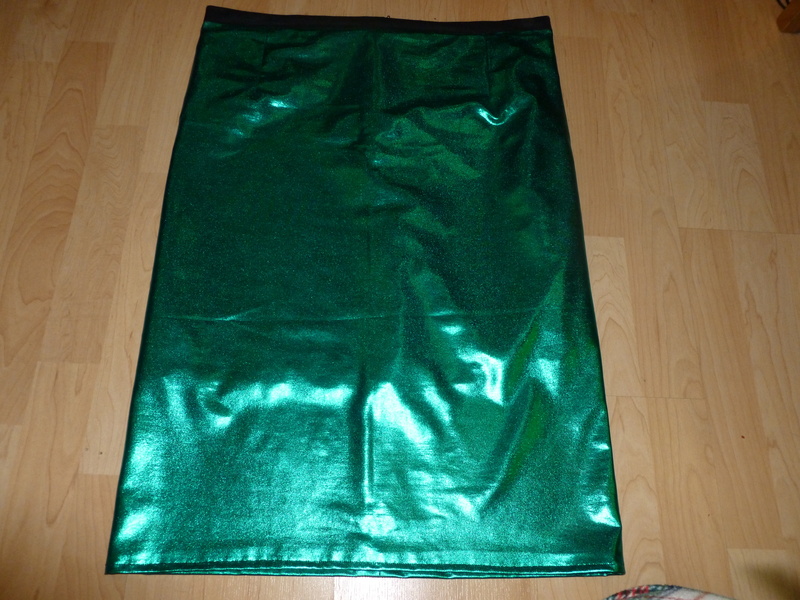 I had no pattern for a straight skirt & it seemed fairly straightforward so I drafted the pattern using the very handy guidance at the site below. I also came across these videos about making an A-line skirt without a pattern which I think are pretty good. It was pretty simple but as always with these things, not having a pattern makes everything a lot more time-consuming. I managed to make it way too big around the waist on my first go. Top tip – don’t be lazy like me & do fittings while wearing tracksuit bottoms – not too smart. Also, I think the placement of my darts doesn’t look quite right – this is partially to do with making the waist too big of course. I was lazy (and wanted to wear the skirt in a hurry) so I just machine stitched the hem – I think it looks fine and seeing as I was using black thread I think it was an ok option (instead of having the odd hand-stitch visible on the outside). This is not a garment that’s going to last a million wears. At the seams that stretch in wear (e.g. 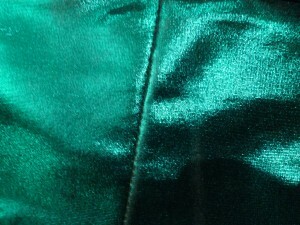 zip, hips and knees), the colour has come off the material. It’s not very noticeable at this point I hope (see exhibits A & B below) but it will reduce its longevity. Lining is important unless you want to show every contour of your body – very clingy! Definitely a nice neat way to do a waistband. 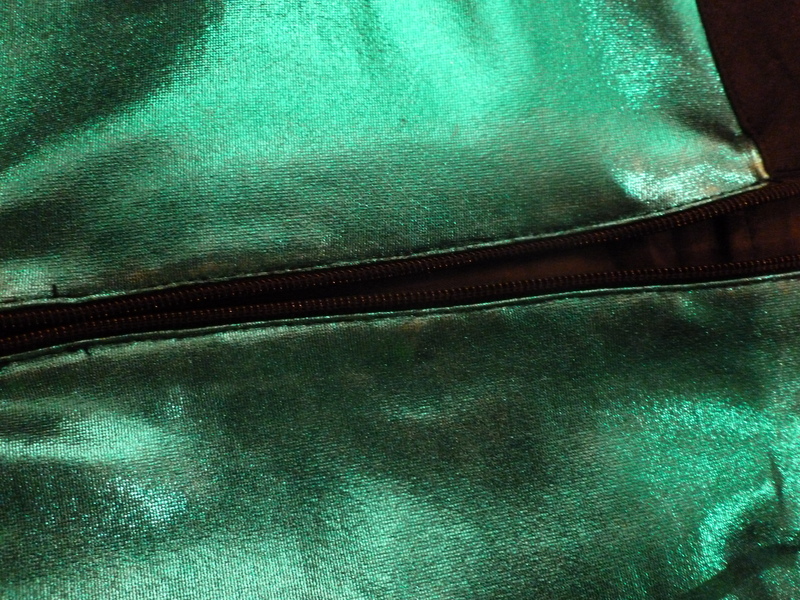 When sewing down the lower edge however, do NOT sew the lining with it as I did – it makes life very difficult when putting in the zip (see below) – there was a lot of ripping & swearing on this bit. I had to re-do the zip a few times (as I mentioned in the previous post my first attempt made me look like I had a tail!). Sinead got a great tip from a lady in Hickeys once which I never seem to remember on the first go! For any fabric with a bit of stretch in it it helps to iron on some interfacing to the wrong side of the material – this stops it from stretching as you sew and stops you from getting a bumpy zip. All in all, despite the various imperfections I’m pretty happy with it and its general jazziness. Not an everyday skirt but I’m confident it’ll get a few more outings! This entry was posted in Completed Garments, Off pattern adventures and tagged Not for everyone, Shiny, Skirt, Zip troubles by Aoife. Bookmark the permalink. Surprisingly nice outcome for green lurex material! !